On the banks of the Tiber, just a few hundred yards from the the Vatican’s front door, you’ll find a guitar player. At least, that’s where I found him. He’ll be sitting on a busted amp, leaning against a Roman tomb, playing songs from Memphis. The beat stopped me in my tracks. The twang of the guitar, the 4/4 time signature, the simple licks that changed the face of popular music—they were the sounds of home. 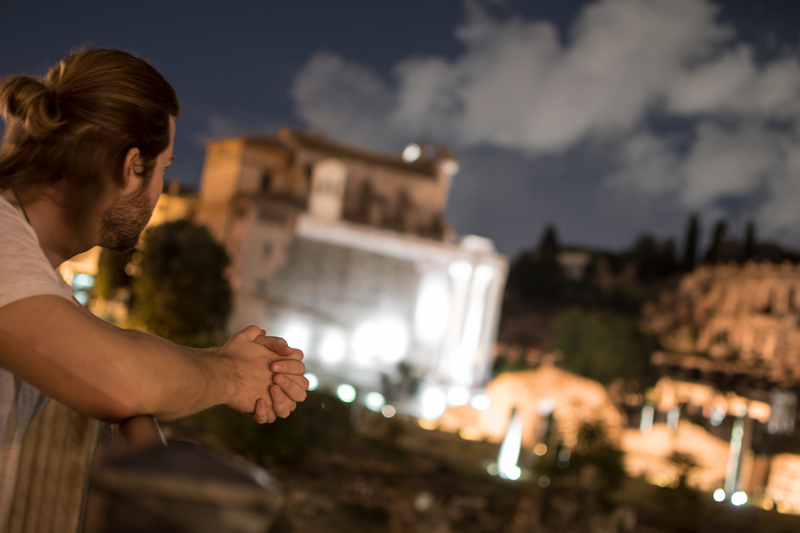 A half a world away, within sight of the Pope’s walled city, under the shadow of Hadrian’s mausoleum, in the very heart of Rome, my city reached out to check in. For most of the day, I’d been be-bopping around Rome searching for photo ops. Headphones in, I’d made quick work out of the Circus Maximus, a probable heroin den on the banks of the Tiber, and the Vatican. But as I came full-circle at Castel Sant’Angelo—where Italian Gitarzan was set up—I popped them out. I never put them back in. I stayed for about an hour, listening to the sound of Memphis in the most unlikely place I can imagine, every so often dropping a few coins in the guy’s case. As the sky darkened, I began the long walk back through the crowded city streets. But a funny thing happened on the way to the forum: all throughout the city, I kept walking past pockets of American music. In the eerie evening glow of Trajan’s Forum, a shaggy-headed guy painted a poor man’s portrait of Bob Dylan; and near the Colosseum, a kid with skinny jeans was covering Jimi Hendrix and the Foo Fighters. Yet, the real moment came at the deserted Roman Forum. It was the moment I knew I could head home. It was the universe telling me it’s okay to leave now. First came a lone note, long and painful, a guitar string singing to itself. Then another. Then, the notes multiplied and sang louder. When that happens, it ain’t nothin’ but the blues. And I’m here to tell you, the blues fell over the ruins of Rome this night. I stood on the dark edge of ruin, distanced from the crowd on the streets behind. My only company was a pizza box that I’d dragged halfway across town…and the trailing echoes of those strings. I don’t know how to put you in that moment; how to transcribe the feeling of roving halfway across the globe, gazing at the birthplace of western civilization, and having a piece of home reach out and grab you. It was bizarre. It felt like a welcome, though I know it wasn’t. People from all over the world like American music. That’s no secret. But somehow, this felt like my music. It felt like an early welcome home gift from a city 5,000 miles away. If my eyes were dry and sore before that moment, they weren’t when I left. The people here, they know Memphis. They listen to our music. They play it in the streets. And the people who read this blog—especially the ones from the Bluff City—should know that. Rome was once the center of it all, but so much has been lost. What the barbarians didn’t take, the church did. These ruins, fenced off and locked in cages under the modern streets, are all that remain of a time when world art, science, and philosophy were dominated by one city. In the centuries since its fall, countless other cities have stepped up to fill the cultural void left by Rome. You all know the flagships like Paris, London, and Tokyo. But the Romans know of another, a small town on the banks of the Mississippi River in far-flung Tennessee. Yes, Rome knows Memphis. Now, a little piece of Memphis knows Rome.